Let’s start smashing, shall we? 1. Dear God did I want to like this. 2. I’m something of a fan of the Wachowskis. Bound and Speed Racer are fun, and I adore the Matrix Trilogy (yes, even the sequels). And I have nothing against Tom Tykwer, either. I enjoyed Run, Lola, Run, and admired his stab at making a Kieslowski (Heaven). I wish there were more filmmakers out there like the three of them. 3. 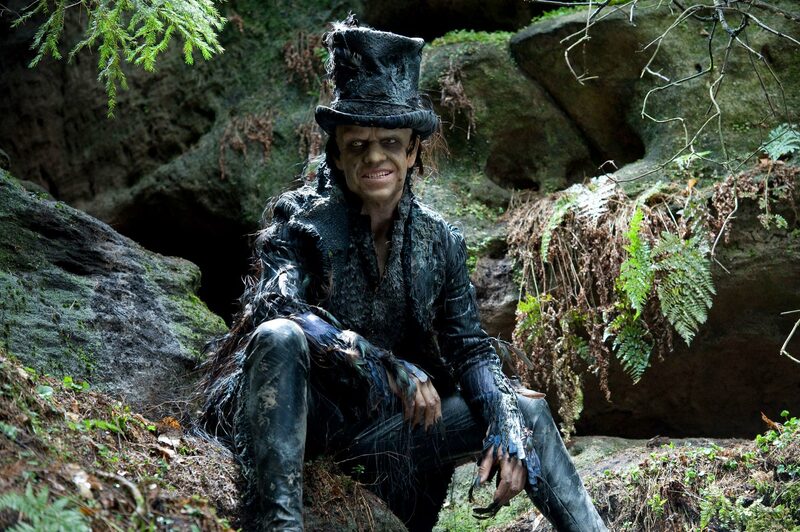 Cloud Atlas is pretty well-directed. It presents six different plots across six different timelines, and (speaking for myself) it was easy to follow, narratively. That’s not nothing. 4. I’ve long argued that Titanic is a very well-made film. It’s three hours long, with dozens of characters, and it never becomes confusing, never drags. 5. This will not be the first time I compare Cloud Atlas with Titanic. Mind you, I have my problems with the book. The writing itself is overwrought, annoyingly affected, and quite frankly not worth the effort. It lacks the pleasures on offer in comparable works by Italo Calvino and Alain Robbe-Grillet. But I’ll readily admit that the structure is both clever and very elegant. 7. Cloud Atlas, the film, throws that elegance off a balcony. 8. Even more disappointing was the Wachowskis’ and Tykwer’s decision to flatten the sections stylistically. In the book, each time period is rendered in its own style. Thus, Adam Ewing’s Pacific Journal is presented as a journal, Frobisher’s letters to Sixsmith are presented as letters, the Luisa Rey mystery is presented as a pulp mystery, and so on. Despite my qualms with the actual (joyless) writing, I think delightful Mitchell’s omnibus approach. However, in the film, each section is stylistically identical. I can understand why that was done. 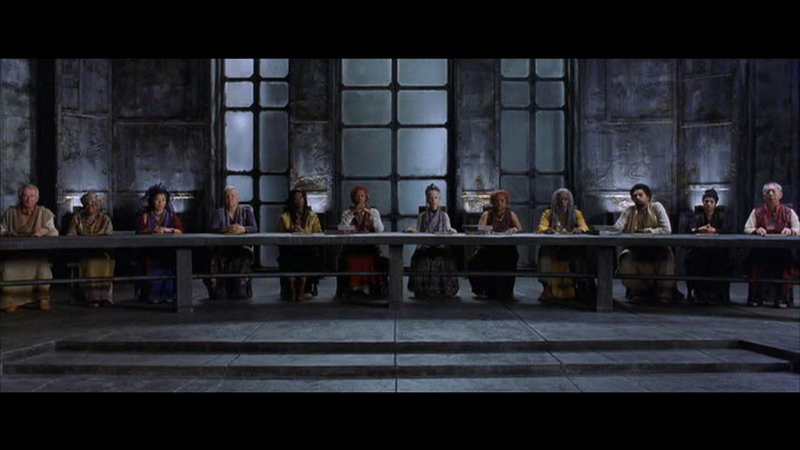 Once the Wachowskis and Tykwer decided to crosscut the six plots together, their mission became one of finding ways to make the different timelines flow into one another, emphasizing points of connection rather than rupture. But it’s a real loss. Ultimately, I found the film’s consistently bright and even style a letdown. Thinking back on it now, the only part that stands out stylistically is the scene where Luisa Rey and Sixsmith got trapped in the elevator. 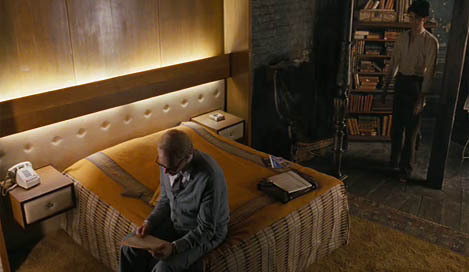 Cloud Atlas takes place entirely in Zion. The main challenge was the novel’s convoluted structure: the chapters are ordered chronologically until the middle of the book, at which point the sequence reverses; the book thus begins and ends in the nineteenth century. This couldn’t work in a film. “It would be impossible to introduce a new story ninety minutes in,” Lana said. Andy agreed. “ ‘Cloud Atlas’ is our getting back to the spectacle of the sixties and seventies, the touchstone movies,” he said, rubbing his bald dome like a magic lantern. The model for their vision, they explained, was Stanley Kubrick’s “2001: A Space Odyssey,” which the Wachowskis had first seen when Lana, then Larry, was ten and Andy seven. 10. “Rubbing his bald dome like a magic lantern”? 11. Anyway, even if the Wachowskis and Tykwer couldn’t keep the book’s original structure, it’s a shame they didn’t replace it with something more innovative or interesting than constant crosscutting. … Remember when this fun little moment happened? That’s hardly the most innovative thing in the world—I think I’ve seen insurance commercials that use the same effect—but why is this the only time in the film when this happened? Why didn’t the movie explore more ways to tie its various strands together? The 60s and the 70s will have to keep waiting to be reborn. That went right over me. But it’s apparent by now that the end result has not gone over like gangbusters. After one month, the film has grossed less than half its $100 million production budget. And as of Thanksgiving, it was entirely gone from theaters in Chicago (I caught one of the last screenings, one week ago). In the past two weeks, it’s dropped from over 2000 theaters to just 258, where it’s averaging $1601 apiece. Ouch. 13. 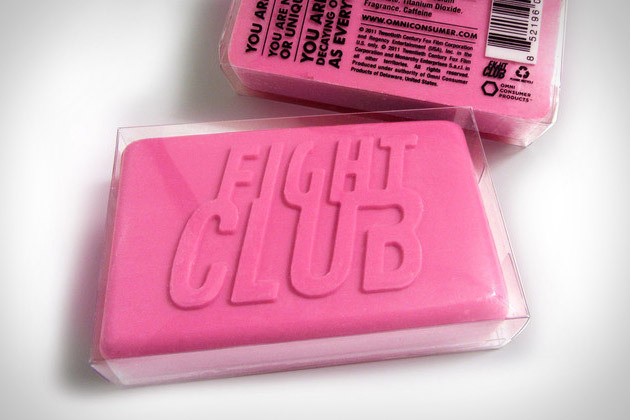 Maybe they should have done some clever merchandising tie-in with soap? “How do you do?” said Mr. Simmons. Reading Cloud Atlas along those lines, Sonmi~451 is Bradbury’s book; Luisa Rey is Thornton Wilder’s. And you think the Wachowskis, of all people, would have gotten that. 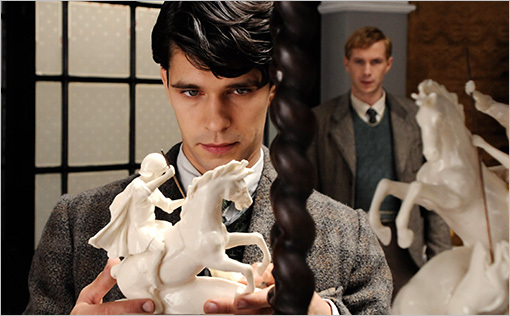 But Cloud Atlas, the film, constantly labors to conceal its artifice and materiality. The events of each timeline are presented the way most films do, as witnessed events: we just happen to be watching, somehow, what’s going on in each time and place. What’s more, the film is entirely hermetic, so concerned with its own stories that it never branches out toward other movies, to the larger body that is cinema. The 451 reference, and the Soylent Green allusion—those were already in the book. The Wachowskis and Tykwer, as far as I could see, brought nothing new to the table—unless the flying ships in Neo Seoul were nods toward the Nebuchadnezzar in The Matrix. 15. All of this is to argue that the Wachowskis and Tykwer remained too slavishly faithful to the book in a literal sense—but thereby lost the project’s larger meaning. 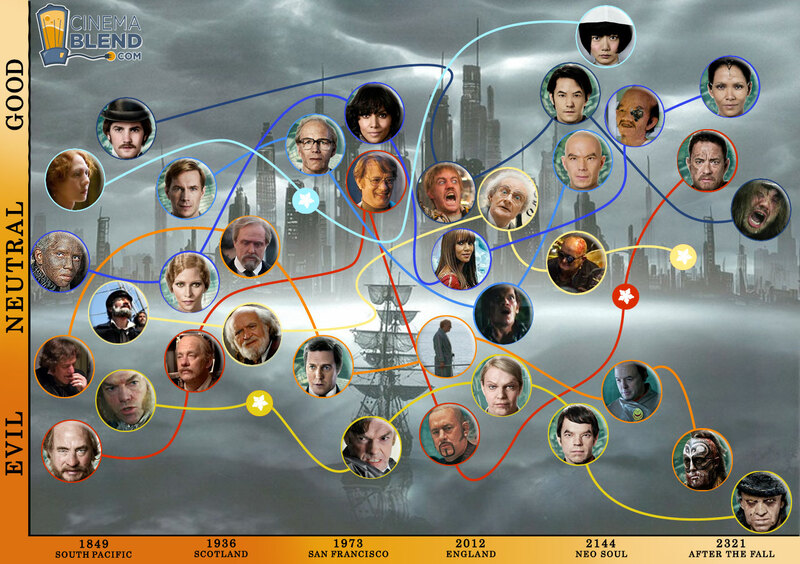 Indeed, their adaptation severely warps Cloud Atlas. The film’s paucity of self-conscious artifice shifts the project’s weight entirely onto its more metaphysical aspects. Thus, the whole thing becomes a heaping pile of mush about reincarnation, accompanied by a healthy side dish of treacle regarding how the chosen ones are reborn until the day when they can finally throw off totalitarianism’s yoke (which recalls that tossed-off idea in the Matrix films that the machines destroyed Zion numerous times before Neo showed up to save the day). This is essentially what replaced David Mitchell’s rather elegant design. But what did the more subtle repetitions accomplish? If I need a chart, or the closing credits, to explain to me that Halle Berry was playing some anonymous back alley Borg Collective doctor—well, what of that? How do turns like that—while certainly impressive technically—help advance the film’s cosmic dream of eternal return? The more a performance was buried under makeup, the more it struck me as gimmicky—some pale imitation of Kind Hearts and Coronets. I suspect that what happened was the filmmakers got so invested in the concept that they lost sight of their larger project. It became something clever to do for its own sake, and not geared toward any larger end. 17. I do think Cloud Atlas is a hell of a lot better than Inception. 18. But over the Thanksgiving holiday, I saw Lincoln, and that film’s willingness to take seriously the complexities of human concepts like “rights” and “freedom”—i.e., the ways in which our selves are written, socially and legally, by others—makes the revolutionary claptrap in Cloud Atlas look like … well, claptrap. The Wachowskis, despite their apparent fondness for philosophy, never actually do the deeper thinking that philosophy requires. Cloud Atlas talks a big game about rebellion and revolution, but its ideas prove ultimately as shallow, and as superficially Manichean, as George Lucas’s. 19. All of this being said, I really did enjoy watching the film. I was entertained by it, and I admired a lot of it technically. … Actually, the movie solved the major problem I had with Mitchell’s novel. Because while the Wachowskis and Tykwer jettisoned what was most impressive about Cloud Atlas the book (its overall structure and changing styles), they made the individual plotlines much more engaging. 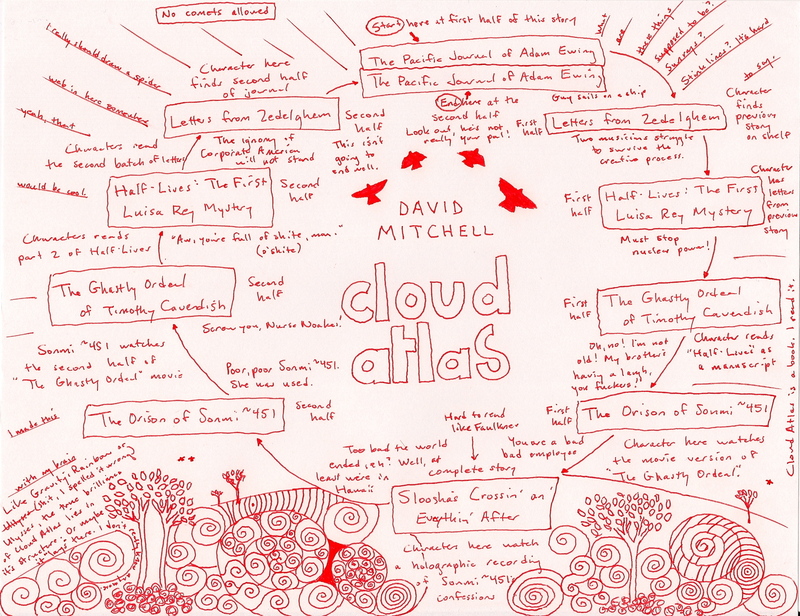 As I stated earlier, I prefer thinking about Mitchell’s Cloud Atlas to actually reading it, mainly because I find the book, taken page by page, tedious and unfun. The Wachowskis’ drops don’t add up to much of an ocean. But they’re entertaining enough drops. 20. I also found the movie more emotionally engaging than the book (which I find pretty dry). The crosscutting ultimately proves thoroughly cathartic. In the theater where I saw it, a lot of people choked up at the end. 21. I will neither confirm nor deny whether I, too, got the sniffles. But, hell, I cry at the end of Titanic. 22. Speaking of which, here are some other recent films that Cloud Atlas reminded me of: Titanic, Forest Gump, The Fountain, The Tree of Life, The Adventures of Baron Munchausen. All of which are ambitious and technically accomplished films wrapped around cloyingly trite ideas. However. 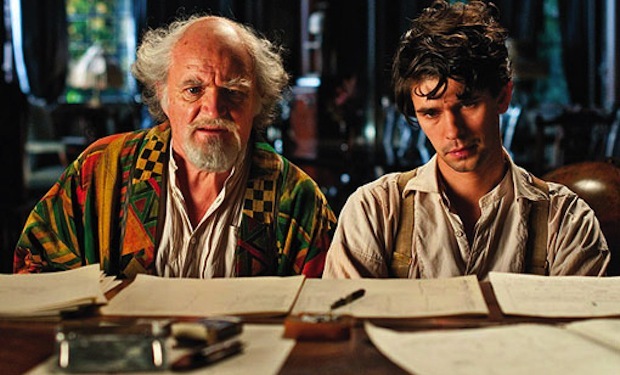 One of Cloud Atlas‘s saving graces is that it doesn’t come off as pretentious. It’s too well-intentioned and goodhearted for that. It’s a generous, loving film. I’d label it primarily naive. 23. Despite its flaws, I do wish there were more movies out there like Cloud Atlas, and more filmmakers like the Wachowskis and Tom Tykwer. 24. However. Cloud Atlas: The Movie accomplishes less in its 180 minutes than the Star Trek: The Next Generation episode “The Inner Light” does in 45. 25. Oh, right; I almost forgot. Regarding the transcendent and resplendent Cloud Atlas Quartet: I’m afraid I didn’t leave the theater humming it, nor has it haunted my dreams ever since. But the piece that played over the closing credits did remind me to some extent of Michael Nyman’s magnificent Musique à Grande Vitesse. Now there’s a tune worth dying and endlessly being reborn for. 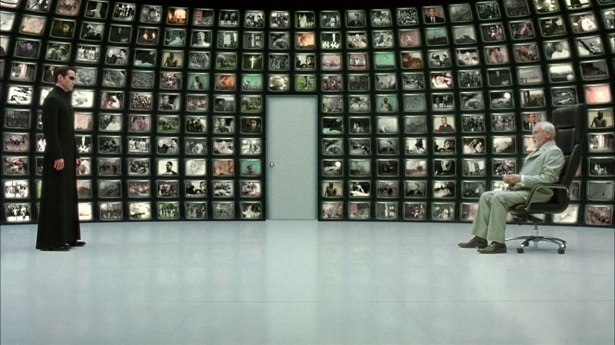 And here’s an inventory of all my articles on cinema, including “How Many Movies Are There?” and “How Many Movies Have You Seen?” … Thanks for reading!